All American: Is the CW TV Series Cancelled or Renewed for Season Two? 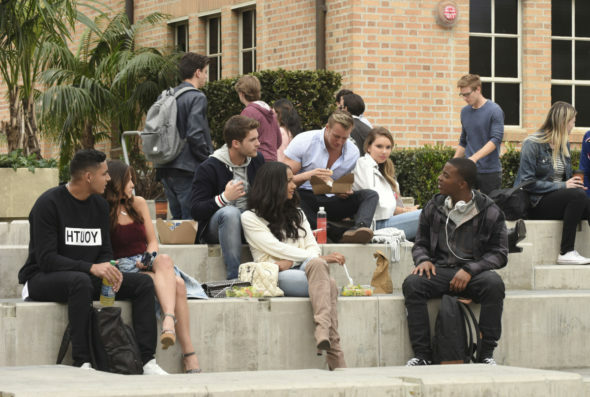 Will Spencer James remain at Beverly High? Has the All American TV show been cancelled or renewed for a second season on The CW? The television vulture is watching all the latest cancellation and renewal news, so this page is the place to track the status of All American, season two. Bookmark it, or subscribe for the latest updates. Remember, the television vulture is watching your shows. Are you? A CW football drama, All American stars Daniel Ezra, Taye Diggs, Samantha Logan, Bre-Z, Greta Onieogou, Monet Mazur, Michael Evans Behling, Cody Christian, Karimah Westbrook, and Jalyn Hall. Inspired by the life of NFL player Spencer Paysinger, the series centers on Spencer James (Ezra), a rising high school football player and an A student at Compton’s South Crenshaw High. When Beverly High football coach Billy Baker (Diggs) recruits Spencer to join his team, the young man must learn how to live in two worlds at once, maintain his grades, and still leave it all on the field. The first season of All American averaged a 0.22 rating in the 18-49 demographic and 675,000 viewers. Learn how All American stacks up against the other CW TV shows. As of April 19, 2019, All American has not been cancelled or renewed for a second season. Stay tuned for further updates. Will The CW cancel or renew All American for season two? The numbers haven’t been very good and this series isn’t based on a pre-existing property so I’m thinking we’ll see a cancellation. I’ll update this page with breaking developments. Subscribe for free All American cancellation or renewal alerts. TV show ratings are still important. Follow All American‘s weekly ups and downs. Find more All American TV series news or other CW TV show news. What do you think? Do you hope the All American TV show will be renewed for a second season? How would you feel if The CW cancelled this TV series, instead? More about: All American, All American: canceled or renewed?, All American: ratings, The CW TV shows: canceled or renewed? Awesome series. Please renew a second season. Awesome show! I would like to see the series renew. This 63 yr.old mom loves this show.Love the characters & storyline. Plese renew it!